The important distinction between people who reinvent themselves and those who stay stuck is knowledge of self combined with the ability to confidently identify the right platform—one that best leverages their natural personality strengths. There are three overarching structures within the system; let’s define each heading and subheading and then consider how each flows into the next career juncture in a continuous, virtuous cycle of constant renewal. Personal effectiveness: Effortlessly exploiting your personality strengths. Hitting on all cylinders, performing at your best because you love what you are doing. Role-personality alignment: When who you are naturally synchs with what you do. Your personality traits and behavioral patterns align with your function, responsibility, and status. This positive energy is magnified through perceived trustworthiness. You lead and inspire through authenticity. Platform: The environment where you execute. A platform is both a choice and a constraint. There are countless platforms on which to perform. Opportunity space: The business sector and niche you land in, whether through fortuitous circumstances or calculated effort. Leadership outcomes: Bottom-line results. Reflects the consequences of your decision-making, along with personality strengths, and weaknesses. Information: Knowledge, facts, data, and observations that reduce uncertainty. Personal development: Your own growth and maturational advancement. Psychological progression through experience, with focused energy directed toward realizing your vision. External sources: Training; executive coaching; modeling people you respect; formal and informal 360s; deep conversations with trusted partners, peers, and colleagues. Internal sources: Reflection, meditation, introspection, self-examination, deliberation. The unconsciousness gradually works its way to consciousness. Self: The image of ourselves. By traversing the model, you now see things more clearly and have a higher understanding of “self.” You’re confident to move to a new platform or opportunity that better aligns with your talents. Or, through your analysis of internal sources, you make adjustments to become more effective in your present situation. You begin to mold your job and role around your core personality strengths. Thus, you become more confident and communicate with even more maturity. 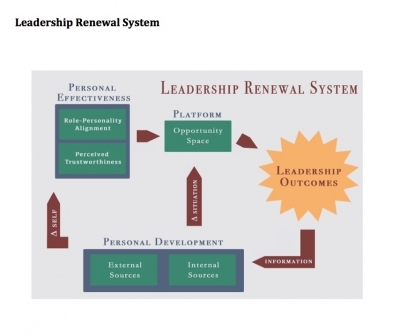 And the leadership renewal system begins anew. 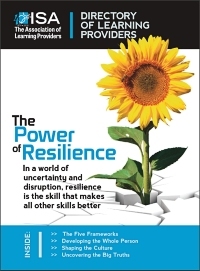 One of the authors had the opportunity to act as executive coach for a senior leader of a global consulting firm. Through executive assessment and job analysis, it was determined that her current role and her personality were poorly aligned. She was highly strategic and creative but was in a purely tactical operational role. What she brought to the table wasn’t being exploited and her boss didn’t appreciate her talents, i.e., her platform was a roadblock to her success. The mismatch of her personality strengths with her platform was reflected in her performance. Of five divisions, her results were dead last. We did a modified 360 and provided a lot of coaching and developmental insights. After our four-month coaching ended, she took a solo bicycle trip in Europe. After this life-changing and cathartic experience, she decided to make a bold career change. She now understood she needed to leverage her natural talent of being creative and innovative. Her challenge was to find a platform where she could focus on developing strategy while someone else ran the operational aspects of the enterprise. She ultimately interviewed to be CEO of a struggling firm. It had operational excellence but needed a leader who could visualize what operational leaders were unable to see. It needed to become more strategic with key customers and not be viewed only as a reliable, back-office business partner. Because of her now accurate understanding of her newly defined brand, she impressed the board with her superior insight into herself. She quickly was offered and accepted a new position as CEO of this smaller firm. We are pleased to report that she is happy and successful in her new role. She renewed her career and changed the road she was on. Each of us will face career successes and disappointments. The important distinction between people who reinvent themselves and those who stay stuck is knowledge of self combined with the ability to confidently identify the right platform—one that best leverages their natural personality strengths. Only then can they add unique strategic value to their ecosystem. Begin to think of your career as a series of opportunities to leverage your personality strength and to stretch yourself by primarily using this strength. Plan your career strategically (which, in our model, is a virtuous cycle). Too many people think of their career tactically, which is a series of different jobs. It’s never too late to change the road you’re on. Those who have successfully done it will tell you it’s a journey worth taking. George W. Watts is chairman of Top Line Talent, an online education company for leaders and sales. The firm trains professionals how to add strategic value. He received his Doctoral Degree in Counseling Psychology from William and Mary and is a former CEO and senior executive. James (Jamie) Millar is founder and president of SkyBridge Associates, a firm that creates the platforms leaders need to build authentic relationships and share valuable insights with each other. He received his Master of Business Administration from Harvard Business School.